This is the latest update report about the USS Fitzgerald crash off the coast of Japan. The damaged USS Fitzgerald was near the U.S. Naval base in Yokosuka, southwest of Tokyo, after the destroyer collided with the Philippine-registered container ship ACX Crystal, a container ship four times its size, in the waters off the Izu Peninsula Saturday, June 17, 2017. The USS Fitzgerald was back at its home port in Japan while the coast guard and Japanese and U.S. military searched for seven sailors missing after the crash. Navy divers found a number of sailors’ bodies Sunday aboard the stricken USS Fitzgerald that collided with a container ship in the busy sea off Japan, but a spokeswoman said not all seven missing had been accounted for. 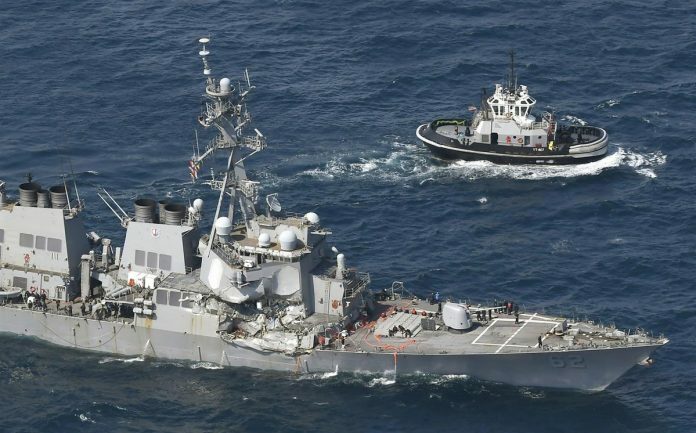 Searchers gained access to the spaces that were damaged during the collision and brought the remains to Naval Hospital Yokosuka where they will be identified, the Navy said in a statement. Seven sailors had been missing, but Yoko Kato, a spokeswoman for the U.S. Navy in Yokosuka, said not all were recovered. She didn’t say how many were found. Japan’s coast guard officials said the sea and air search was still continuing at the site of the collision, 56 nautical miles (103 kilometers) southwest of Yokosuka, home to the 7th Fleet. The Navy said that the families were being notified and provided the support they need during “this difficult time.” The names of the sailors will be released after all notifications are made. Sixteen hours following the predawn Saturday collision, the damaged destroyer was pumping out water as it limped back to its home port in Yokosuka Naval Base south of Tokyo by sunset Saturday, its crew lined up on deck. The Philippine-flagged container ship was berthed at Tokyo’s Oi wharf, where officials began questioning crew members about the cause of the crash. At least three other crew members, including the captain, were injured in the crash, which damaged two berthing spaces, a machinery room and the radio room and exposed a mangled mid-right side of the ship. It wasn’t clear how extensive the damage is below the water line. Most of the more than 200 sailors aboard would have been asleep in their berths at the time of the collision. “This has been a difficult day,” Vice Adm. Joseph P. Aucoin, the commander of the 7th Fleet. “I am humbled by the bravery and tenacity of the Fitzgerald crew. Now that the ship is in Yokosuka, I ask that you help the families by maintaining their privacy as we continue the search for our shipmates,” he said before the announcement that the bodies were found. Seven US Navy crew members are missing after their ship collided with a merchant vessel off the coast of Japan. Among the injured is the USS Fitzgerald’s commanding officer, who was taken to hospital by helicopter. The destroyer collided with the container ship about 56 nautical miles south-west of Yokosuka. 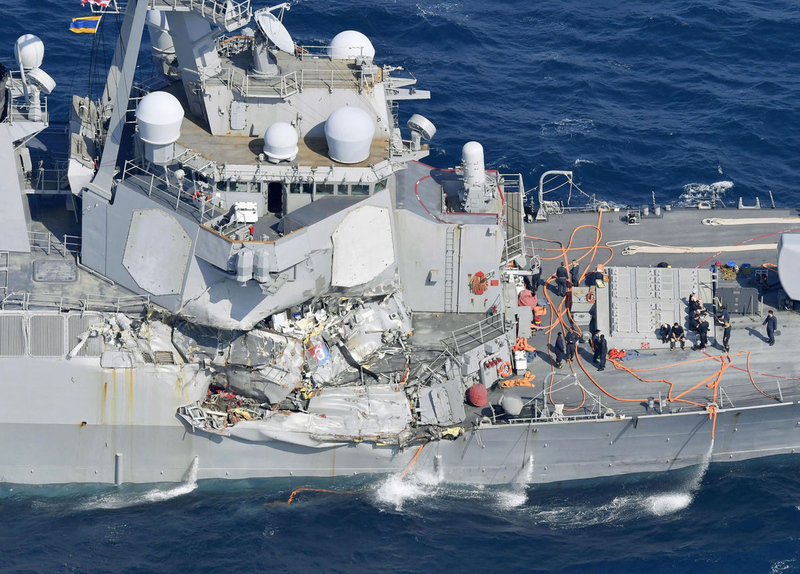 Aerial images showed heavy damage to the Navy ship’s starboard side after the collision at about 02:30 local time on Saturday (17:30 GMT Friday). The collision occurred near Yokosuka, a Japanese port city that is home to the US 7th Fleet, which comprises up to 80 submarines and ships and including the USS Fitzgerald. It is unclear where the 505ft guided missile destroyer ship was heading at the time. The ACX Crystal, a 730ft Filipino-flagged container ship, was travelling between the Japanese cities of Nagoya and Tokyo. Marine traffic records suggest the ACX Crystal made a sudden U-turn roughly 25 minutes before the collision with the USS Fitzgerald. It is not clear why it changed course. Marine traffic records suggest it was travelling at 14.6 knots at the time of the collision. How bad are the damage and injuries? Japan’s coastguard is co-ordinating the search with US teams for the seven missing crew members. As of late afternoon local time, the 7th Fleet said the crew members were still unaccounted for. The Navy ship’s commanding officer, Cdr Bryce Benson, was in a stable condition after being transferred to US Naval Hospital Yokosuka, according to Navy officials. Two other sailors were flown to hospital by helicopter for treatments for “lacerations and bruises”, the 7th Fleet said on Twitter. By mid-afternoon local time, it said that all flooding on board the USS Fitzgerald was under control. It is not at risk of sinking. The ship has now returned to Yokosuka – under its own power, but with limited propulsion. The Japanese coastguard said the ACX Crystal had a gross tonnage of nearly 30,000, about three times that of the USS Fitzgerald. It sustained lighter damage to its port bow, and has now reached Tokyo. The Associated Press agency said there were no injuries reported among the 20 Filipino crew members on board the container ship. Relatives of those on board the USS Fitzgerald have been posting on the US 7th Fleet’s Facebook page, requesting information on their loved-ones. An information hotline has been set up. The collision took place in waters that get heavy traffic and that have experienced prior collisions, Japanese broadcaster NHK said. Ships travelling to and from Tokyo, as well as crossing the Pacific in both directions, pass through the bay where the crash happened. NHK said that an association of commercial ship captains is calling for the creation of east-west lanes in the area to avoid collisions. The area where the collision took place is extremely busy, with shipping heading in and out of Tokyo bay. However, the USS Fitzgerald is one of the most advanced warships in the world – with highly sophisticated radar systems. At the moment the focus is on the search for the missing sailors. Later will come the investigation into how one of the world’s most sophisticated warships failed to avoid colliding with a 30,000-tonne cargo ship on a calm, clear night. Here’s the latest news about the USS Fitzgerald crash off the coast of Japan. The ship collided with a merchant vessel. Seven US Navy crew members.